The Chosen of the Incarnae, the Dragons, the Neverborn, the Yozis and the Great Maker all strive to chart the course of Creation. In their attempts, these Exalted heroes often come into conflict or alliance. 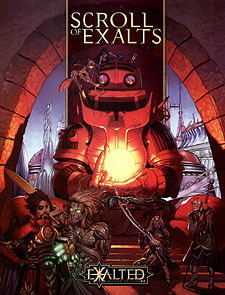 Found within are examples of all seven types of Exalt, ranging from the ancient Sidereal Chejop Kejak to the young Dragon-Blood Cathak Meladus and all ages (and power levels) in between. Some aim to destroy the world, while others strive to save it, but regardless of motive, the movers and shakers and the up and comers alike are bound to come into contact with your characters. Whether as friend or foe is up to you to determine. Write-ups for many of the game's most renowned Exalts, many of whom have never been statted. More than 70 ready-made allies and antagonists for players and Storytellers alike.